Preston Nomads remain top of the Premier table thanks to a five-wicket victory against Horsham on Saturday. Horsham won the toss and elected to bat and posted a target of 190 all out from their 57.5 overs. J Johnson top scored for Horsham with a determined 61 while Kashif Ibrahim (4-42) and Carl Simon (3-59) did the damage with the ball for the Nomads. In reply the Nomads reached their target in the 40th over for the loss of five wickets. Dan Phillips (68) and Robert Wakeford 70* were the main contributors with the bat. Roffey however maintained the pressure on the leaders thanks to their 87 run home win against Bexhill. Batting first Roffey set a target of 214 all out from 57.1 overs with Matt Davies 61 not out. Asher Zaidi performed well with the ball taking 4-55 for Bexhill. Nick Peters top scored with 39 not out in Bexhill’s 127 all out. Leigh Harrison was the lead bowler with 3-24. The victory sees Roffey just five points behind the Nomads. Eight wickets from Steffan Piolet helped Cuckfield to third in the table as they beat Eastbourne by 30 runs. Cuckfield batted first were all out for a modest 169 with Eastbourne’s Matt Cooke claiming 5-51 and David Twine 4-48. In response Eastbourne were blown away by Piolet’s 8-51 as they were all out for 139. Eastbourne remain in sixth place. East Grinstead enjoyed a six-wicket triumph against Brighton and Hove and moved up to fourth in the league. Brighton reached 203 all out from 42 overs as Phil Salt top scored for them with 53. Bradley Hatchett was on form with the ball as he picked up 5-52. Grinstead raced to their target in 34 overs with Carl Cachopa (80) and Ollie Graham (52*). A six-wicket haul for Jofra Archer helped lowly Middleton to a much needed win against Billingshurst. Rob Woodman top scored with 45* as Billingshurst posted 145 from 40 overs. 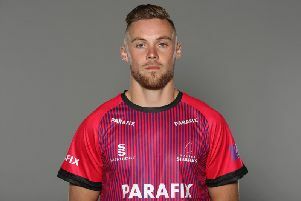 Middleton opener Sean Heather made 54* and Jofra Archer made a rapid 58 from 42 balls. Billingshurst bowler Dhanushka Mitipolaarachchi claimed 4-51. Pagham remain top of division two from Hastings and St Leonards Priroy by just one point after their 81-run loss to Lindfield. Max O’Dowd (101) cracked a fine century and Hayden James contributed 61 as Linfield reached 235 all out. James (7-32) completed a fine allround display as he helped skittle Pagham out for 154. Linfield move up to fourth. Hastings posted 196-8 as they batted first in their 72 run win away at Ifield. Elliott Hooper top scored with 50 for the vistors. In response Ifield were all out for 124 as Adam Barton (5-26) and Jed O’Brien (5-43) both claimed five wicket hauls for Hastings. Worthing are also close behind in third place after their comprehensive eight-wicket win against Three Bridges. Bridges posted 146-8 as Worthing’s Benn Challen claimed 4-39. They reached their target in 28 overs for the loss of two wickets as Sam Jones cracked an unbeaten 58 from 53 balls. Fifth placed Findon won by three wickets against Ansty as Felix Jordan took 5-45 and then contributed 33 with the bat. Sam Cooper hit an unbeaten 127 as St James’s Montefiore won by 142 runs against Crowhurst Park. Bognor Regis lead the way in division three courtesy of their 112 run triumph against Chichester Priory. Zayne Bux top scored with 91 as they reached 240-4 from 53 overs. Graham Bush (4-31) and Joe Ashmore (4-42) did the damage with the ball as Chi were all out for 128. Burgess Hill won comprehensively by 10 wickets at Haywards Heath and are second in the table with Crawley Eagles third after their five wicket win at Steyning. Jibran Khan (5-67) as Steyning were all out for 214. In reply Khan hit 58 and Fazlan Nizamdeen 70* as the Eagles surpassed the total in the 47th over. Portslade and Glynde & Bedding are both on 95 points after Portslade’s eight-wicket win at the Recreation Ground. Paul Glover top scored with 74 runs for Portslade. Rottingdean’s Henry Ledden hit an unbeaten 102* as his side beat Goring by Sea by eight wickets. Slinfold top the table in division four after a three wicket home win aginst Henfield. Brighton Mugochi fired 76 as Henfield reached 224 all out with Slinfold’s Paul Osbourne (4-26). In reply Craig Skilton’s 72 helped them reach the target in the 47th over for the loss of seven wickets. Mayfield are second after their 142 run win at Wisborough - Marnao Pretorious with 6-35 for Mayfield. Rye’s Kshemal Waingankar cracked 159 not out as they won by 93 runs against Southwater while Stirlands moved up to sixth as they beat Crawley by 98 runs. Lee Pittavino took 7-33 for Hassocks as they won by six wickets against basement side Hellingly.